Today I was rocking Ruby Pumps polish by China Glaze, a gorgeous red glitter that brightened both my all-black outfit and my disposition. 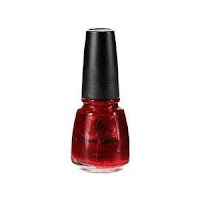 As pretty as this looks in the bottle, it’s so much prettier on the nails; the red glitter under its bright red jelly base sparkles and shines without looking too over the top. I found it really easy to apply, too -- I gave it two coats over a Nails Inc base coat, skipped the top coat and was still happy with the finish. I noticed a bit of tipwear today on a couple of nails so I’ll give it the full works next time, which will be soon, because this colour just makes me really, really happy. But as much as I was loving my nails, I had a sudden brainwave that would make them even better. This picture does not do either polish any justice! As soon as I got home I lashed on a coating of Barry M Instant Nail Effects in Black Magic. I won this as part of Karen’s fabulous blog giveaway over at the very aptly named lovelygirliebits and was delighted -- I got her gorgeously packaged goodies on Friday and the only reason I haven’t slapped this on sooner was because I accidentally left it in work over the weekend. This stuff rocks! 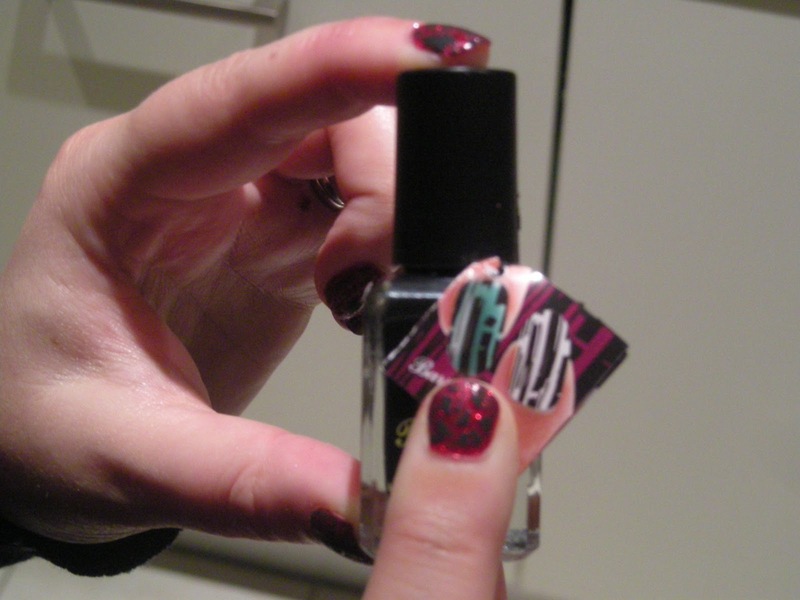 It applied in no time at all and dried in seconds to leave a really cool, snakeskin type effect on my nails. Unfortunately I failed to capture its beauty in these photos, but I completely adore this combo. I think it looks great with how short my nails are at the moment and it helps that it’s the party season, when you can be a little more tacktastic than usual. I’m not sure it’s one I’ll be wearing all year round, but for me, it feels very right for right now. Oh love ruby pumps so much, it's perfect for Christmas. I like the barry m over it too, but then the barry m looks great over everything! Thanks lady - really looking forward to experimenting with the Barry M stuff over a variety of colours. 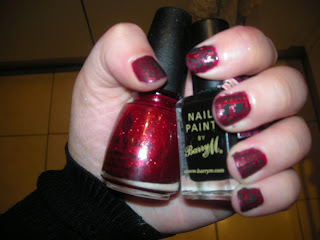 amazing, I adore both those polishes (from a distance, though i did manage to get my paws on the Barry M today, yeeeey!). also, extra brownie points for quoting Liz Phair lyrics, she = awesome. I don't believe it - a fellow Liz Phair fan! We're a rare but very discerning breed - I've only met about 5 other people who know/like her in my lifetime! Exile in Guyville is The Bomb.